Hardy to Zones 9 to 12, otherwise grown as a summer annual, 90 days to seed. Tropical perennial, temperate annual. Originally native to Africa , now widely introduced to southern climates. 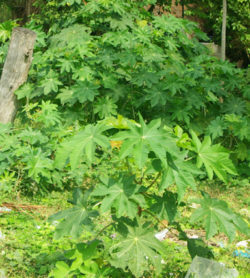 Largest of all the castors with green, prominently veined leaves up to 3 feet across on a plant up to 20 feet tall. Even when grown as an annual, lends a tropical touch. The seeds are toxic and should never be ingested. 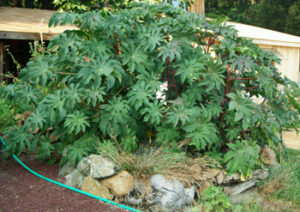 To grow castor, give full sun and plenty of compost. 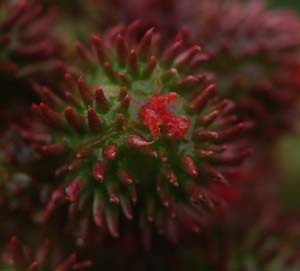 Direct seed in spring.